Nixon Motor Sports: Hey Buddy, Wanna See Some Trabbies? Hey Buddy, Wanna See Some Trabbies? This post was almost about cats, because my auto-correct wanted Trabbies to be Tabbies. This post is NOT about cats. Car cats I WOULD write about would include Jaguars, Panthers, and Cheetahs. 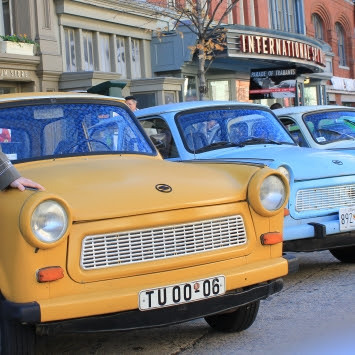 So, back on topic, Trabbies, more formerly known as Trabants, the infamous cheap cars built in East Germany during the cold war. What made them special? Well, that they were one of the few cars built in East Germany, but also that parts of the body were made of some recycled cotton material called Duroplast.